I have reviewed your website and find it very interesting. Your article on Lieutenant General Carlos M. Talbott is missing two important things in his life. During his military tour in Europe during World War II, Carlos M. Talbott shot down several German aircraft. He also was shot down by a German Aircraft before his return to the United States. a result of winning the National Air races, he was awarded the Bendix Trophy. His name is inscribed on the original trophy that is displayed in the Smithsonian Museum in Washington D.C. He has a small replica of the trophy displayed in his home in Williamsburg, Virginia. Other winners of the Bendiz Trophy include Astronaut John Glenn. I have known General Talbott for years. Spoke with him today, October 14, 2005. He is alive and well. General Talbott survives as of October 2005. 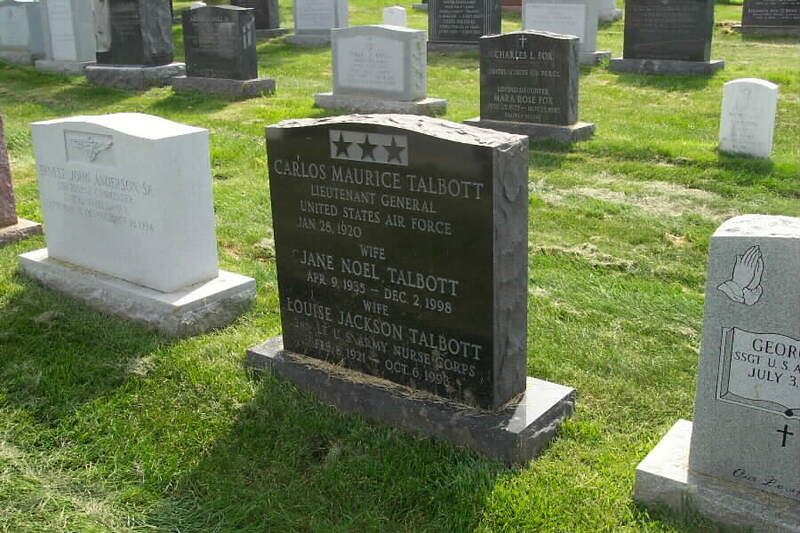 However, his wives, Louise Jackson Talbott, Second Lieutenant, United States Army Nurse Corps(8 February 1921-6 October 1998) and Jane Noel Talbott, (9 April 1935-2 December 1998) are buried in his future gravesite in Section 8 of Arlington National Cemetery. Lieutenant General Carlos M. Talbott was vice commander in chief of Pacific Air Forces with headquarters at Hickam Air Force Base, Hawaii. General Talbott was born in 1920, in Charleston, Illinois, where he graduated from high school. He attended Eastern Illinois University, 1936-1939, and graduated from the U.S. Military Academy, West Point, New York, with a bachelor of science degree and commission as second lieutenant in January 1943. While at the academy, he graduated from advanced flying school at Lake Charles, Louisiana, in December 1942. He received his master of arts degree in international affairs from The George Washington University, in 1964. His first assignment was as a P-40 pilot, Dothan Field, Alabama In March 1943 he became a P-47 pilot with the 326th and then the 368th Fighter Groups at Westover Field, Massachusetts, and Mitchel Field, New York. In December 1943 during World War II, he went with the 368th Group to the European Theater of Operations as a pilot with the 397th Fighter Squadron. From October 1944 to April 1945, he was assigned as assistant operations officer and later operations officer of the 368th Fighter Group. In May 1945 he returned to the United States and was assigned to Seymour Johnson Field, N.C. He attended the Army Command and General Staff School at Fort Leavenworth, Kan., and in February 1946 returned to Seymour Johnson Field to be base adjutant. From May 1946 to March 1948, General Talbott served with the Organization and Training Division of the War Department General Staff in Washington, D.C., and then was assigned to the Directorate of Training and Requirements, Deputy Chief of Staff, Operations, Headquarters U.S. Air Force. General Talbott went to Ankara, Turkey, in March 1949 as a fighter pilot training adviser with the American Mission for Aid to Turkey and in December 1950 became executive officer for the U.S. Air Force Group. In April 1951 he returned to Headquarters U.S. Air Force as an operations staff officer in the Directorate of Operations, Office of the Deputy Chief of Staff, Plans and Operations. In July 1954 General Talbott became commander of the 322d Fighter Day Group, Foster Air Force Base, Texas, and from August 1957 to June 1958 attended the Air War College at Maxwell Air Force Base, Alabama. He then went to Japan as director of tactical operations and later was chief of Combat Operations Division, in the Office of the Deputy Chief of Staff for Operations, Headquarters Fifth Air Force, at Fuchu Air Station, Japan. He was assigned as director of operations, 8th Tactical Fighter Wing, at Itazuke Air Base, in July 1960. General Talbott returned to Headquarters U.S. Air Force in August 1962 as deputy chief, Tactical Air Division, Directorate of Operational Requirements. In October 1962 he became chief, Tactical Nuclear Branch, in the Chairman, Joint Chiefs of Staff, Special Studies Group. He assumed command of the 366th Tactical Fighter Wing at Holloman Air Force Base, N.M., in August 1965, and went to Southeast Asia with the wing in March 1966. He was assigned in May 1966 as deputy director, Tactical Air Control Center, Headquarters Seventh Air Force. In May 1967 he was assigned as chief of staff for the United States Taiwan Defense Command. General Talbott returned to the United States in September 1968 and became vice commander, Tenth Air Force, at Richards-Gebaur Air Force Base, Mo. In August 1969 he was assigned as vice commander, Ninth Air Force, with headquarters at Shaw Air Force Base, S.C. In July 1970 he again was assigned to Headquarters U.S. Air Force as director of operations, Deputy Chief of Staff, Plans and Operations. In August 1972 he returned to the Republic of Vietnam as director of operations, Military Assistance Command, Vietnam, and deputy chief of staff, operations, Seventh Air Force. General Talbott was appointed vice commander in chief of Pacific Air Forces with headquarters at Hickam Air Force Base, Hawaii, in April 1973. He is a command pilot, has flown more than 4,500 hours, and during World War II flew 96 combat missions. His military decorations and awards include the Distinguished Service Cross; Distinguished Service Medal with two oak leaf clusters; Legion of Merit with oak leaf cluster; Distinguished Flying Cross with oak leaf cluster; Air Medal with 15 oak leaf clusters; Air Force Commendation Medal; Purple Heart; Golden Cross of the Royal Order of Phoenix (Greece); Korean Medal of Merit; from the Republic of Vietnam the National Order of Vietnam, 5th Class, Armed Forces Honor Medal, Air Force Distinguished Service Order, 2d Class; Order of Cloud and Banner, Republic of China; and Air Force Wings of Turkey, China and Republic of Vietnam. He was promoted to the grade of lieutenant general effective April 6, 1973, with date of rank April 6, 1973.